Gandiva refers to the ancient mystical bow bestowed upon the famous hero prince, Arjuna. His valiant stories as told in the Mahabharata portrays of his powerful combination with the Gandiva. When in the hands of Arjuna, the Gandiva throws off inexhaustible arrows and produces a thunder-like twang. This rendered them invincible and victorious. From this origin, Gandiva Archery drew inspiration for its purpose. A purpose to bring archery closer to theFilipinos while advocating health and wellness as a lifestyle. Gandiva Archery started in the grassroots. In 2009 and 2010, the Gandiva Archery team became part of the Palarong Pambansa. This opened an opportunity for them to train coaches in different provinces. They would hand carry the archery equipment to far-flung places and would make do of the resources available around them. Eventually, the team made use of a mobile archery truck that was filled with different archery equipment for sale and for training. The warm welcome of each visited province became their fuel and inspiration to propagate the sport to more and more Filipinos. 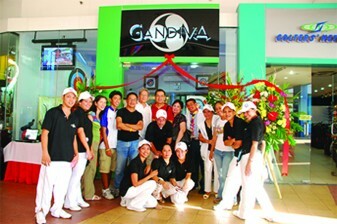 In the latter part of 2009, Gandiva opened its first branch in SM Mall of Asia. It was the very first commercializedarchery range and pro-shop making the sport more available to both beginners and pro-archers alike. In 2013, Gandiva Archery moved to One Corporate Center in Ortigas. It was a bigger range that couldaccommodate bigger groups. This gave Gandiva an opportunity to offer corporate partnerships and in-house events. Tapping into this market developed a wider audience reach and an extensive awareness about archery as a recreational and competitive sport. This attainment paved the way for Gandiva to open its first regional branch in Davao City on January 2016, making it the first indoor archery range in the region. But Gandiva did not want to stop there. It was realized that to truly serve their purpose, they needed to create something modern, accessible and affordable. This gave birth to Arrowland by Gandiva -- an arcade type of archery range that offers affordable arrow packages. Arrowland currently have branches in SM Megamall and SM North Edsa. Today, with the unparalleled success of Gandiva Archery and Arrowland by Gandiva, they bring you Gandiva Archery Center. Located at the Sparta Compound in Mandaluyong City, it is being positioned as the first premier indoor archery range in the country with a well-equipped armory and a state-of- the-art diagnostic center.